Heavenly Valley ski resort is one of the nation's premier ski and snowboard areas. It straddles the border of California and Nevada, and is located on the shore of Lake Tahoe. This resort is renowned for its unbeatable amenities and facilities, which can turn an average ski trip into a vacation that you, your friends and your family will never forget. Why Choose Heavenly Valley Ski Resort? Heavenly Valley is known for varied terrain that provides everything from rolling glades and easy groomed runs to extreme technical steeps and incredible terrain parks. With 4,800 acres, it is one of North America's largest mountains. The mountain has 97 runs and 30 lifts. At 10,000 feet it is the highest mountain in Lake Tahoe. A 3,500 foot vertical is unparalleled on the West Coast. Average annual snowfall of 360 inches makes the deeps impressive. 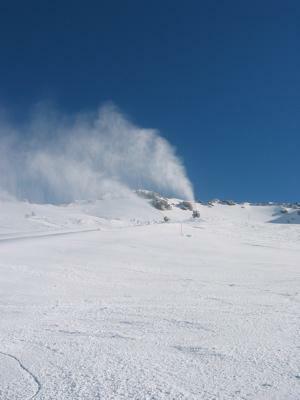 The ski area has one of the largest snowmaking systems in North America, which covers 70 percent of the mountain. Some of the newest on-mountain improvements include Olympic Express, which is a high-speed quad chair that debuted on December 23 in 2007. The Heavenly Flyer is the longest zip line in the United States and is over 3,100 feet long with a 525-foot descent. The Heavenly gondola is in the center of downtown Lake Tahoe. It holds eight passengers for a 12 minute ride that takes skiers and snowboarders 2.4 miles up the mountain. The ride includes a stop at The Deck, a 14,000 square foot observation platform which provides incredible views of Carson Valley, Desolation Wilderness and unprecedented views of Lake Tahoe. There are terrain parks that fit every level, so don't be afraid to try your skill at one of the many different styles and types of parks. Be in touch with the local authorities on what is safe and what should be avoided for avalanche danger on any given day. While fun is a priority, safety is paramount. Heavenly is a top place for skiing and snowboarding, but there is also a bevy of activities for those who don't like to swish down the slopes. Try your skills at cross country skiing, snowmobiling, tubing and dog sled rides. The Tahoe basin is a veritable outdoor playground. There is something here for everyone. There are a plethora of lodging options in Lake Tahoe. From a four-star luxury hotel to a cheap place to throw your sleeping bag, you will find it here. Just steps from the gondola is the Forest Suites or the Marriott Grand Residence and Timber Lodge. If you are interested in a family-friendly option, check out the Embassy Suites. If you are in the mood for something a little more upbeat, try one of the action-packed casino hotels. There are lots of options for life after the ski lifts shut down. Lake Tahoe is known for its nightlife and Heavenly has no lack of options for apres ski bars, dining options and late night entertainment. Because part of the resort is in Nevada, there is a group of first-class casinos that provide the type of experience visitors would expect in this game-friendly state. There are also many nightlife options, including live music from some of the world's biggest acts, as well as comedy and entertainment shows. If you are looking for dining options, check out some of the following restaurants and bars for everything from high-end cuisine to easy-going bar food. 19 Kitchen-Bar: Located on the 19th floor of Harveys' hotel, this dining option offers spectacular views of the Lake and a creative menu. Black Diamond Cantina: If you are in the mood for a little Mexican fare, check out this place inside the Boulder Lodge. Cafe Fiore: Just a short drive from Casino Row is this seven-table restaurant that offers up some stunning food. Edgewood Restaurant: A world-class destination for golf, dining, weddings and special events. Lakeview Lodge & Cafe: Delectable fare and unrivaled vistas make this dining establishment a favorite. Naked Fish: Bringing the freshest catch available, this restaurant is a top choice for those who love everything to do with fish.